Tony Ephremides (L) and Rajeev Laroia. 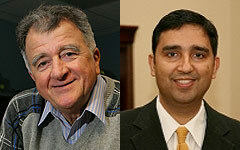 Professor Tony Ephremides (ece/ISR) and ISR alumnus Rajiv Laroia (ECE Ph.D. 1992) were the two featured plenary speakers at the Conference on Information Sciences and Systems (CISS), a prestigious conference now in its 44th year. CISS 2010 took place on March 17-19, 2010 at Princeton University. Ephremides’ talk, “Simply Cooperative,” described new ways in which he and his students are approaching the very topical and current issue of cooperative wireless networking. Laroia, Senior Vice President for Engineering at Qualcomm, spoke on “Proximate Internet,” a new type of peer-to-peer communication technology based on direct communication between physically proximate peers without the need of any infrastructure. At Maryland, Laroia was advised by ECE/ISR Professor Nariman Farvardin, who is currently the Senior Vice President for Academic Affairs and Provost at the University of Maryland.